LEPIDUS: What manner o’ thing is your crocodile? ANTONY: It is shaped, sir, like itself, and it is as broad as it hath breadth. It is just so high as it is, and moves with it own organs. It lives by that which nourisheth it, and the elements once out of it, it transmigrates. LEPIDUS: What colour is it of? ANTONY:Of its own colour, too. ANTONY:’Tis so, and the tears of it are wet. In Antony and Cleopatra (1606-7), II, vii. According to the Boshongo people of central Africa, in the beginning, there was only darkness, water, and the great god Bumba. One day Bumba, in pain from a stomach ache, vomited up the sun. The sun dried up some of the water, leaving land. Still in pain, Bumba vomited up the moon, the stars, and then some animals. 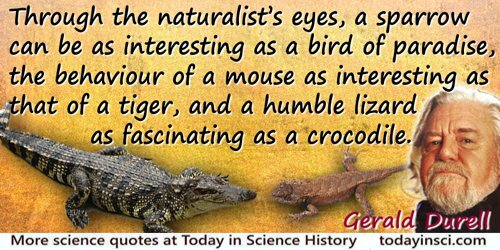 The leopard, the crocodile, the turtle, and finally, man. This creation myth, like many others, tries to answer the questions we all ask. Why are we here? Where did we come from? For a dying man it is not a difficult decision [to agree to become the world's first heart transplant] … because he knows he is at the end. 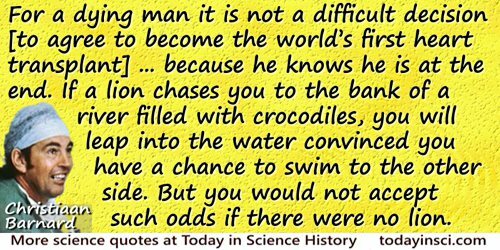 If a lion chases you to the bank of a river filled with crocodiles, you will leap into the water convinced you have a chance to swim to the other side. But you would not accept such odds if there were no lion. In Janie B. Butts and Karen Rich, Nursing Ethics (2005), 59. It is the wisdom of the crocodiles, that shed tears when they devour. When some portion of the biosphere is rather unpopular with the human race–a crocodile, a dandelion, a stony valley, a snowstorm, an odd-shaped flint–there are three sorts of human being who are particularly likely still to see point in it and befriend it. They are poets, scientists and children. Inside each of us, I suggest, representatives of all these groups can be found. Animals and Why They Matter; A Journey Around the Species Barrier (1983), 145. [At the end of the story, its main character, Tom] is now a great man of science, and can plan railroads, and steam-engines, and electric telegraphs, and rifled guns, and so forth; and knows everything about everything, except why a hen's egg don't turn into a crocodile, and two or three other little things that no one will know till the coming of the Cocqcigrues.